These are a lovely side dish or, as I’ve eaten them part of a meze platter in Turkey. I have also had them many times at Greek restaurants. 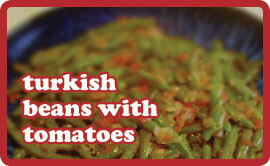 Tomatoes and green beans compliment each other perfectly and are great with fish and lamb. You can eat them hot or cold. You decide. Heat the oil in a large pan, add the onions and cook for 4-5 minutes until golden brown and soft. Add the garlic and cook for 30 seconds. Add the tomato, sugar, 1/2 cup water, salt & pepper. Brin to the boil, reduce heat and simmer for 10 minutes. Add the beans and simmer for 10-15 minutes until they are tender. Remove from heat. Serve hot with fish or lamb, or serve as part of a meze platter at room temperature.